The festival "Vienna Pride" is a two-week event of the LGBTI community with the highlight of the Vienna Pride March (Rainbow Parade) on 16 June 2018 and intends to promote human rights for everybody and achieve equality for LGBTI persons. 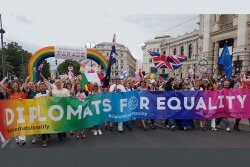 More than 30 Vienna-based embassies and diplomatic missions have come together under the banner "Diplomats for Equality" to support this initiative. Vindobona.org also supports a worldwide non-discriminatory society. The second gay and lesbian Christmas market Pink Christmas in Vienna will be held in November and December 2015.